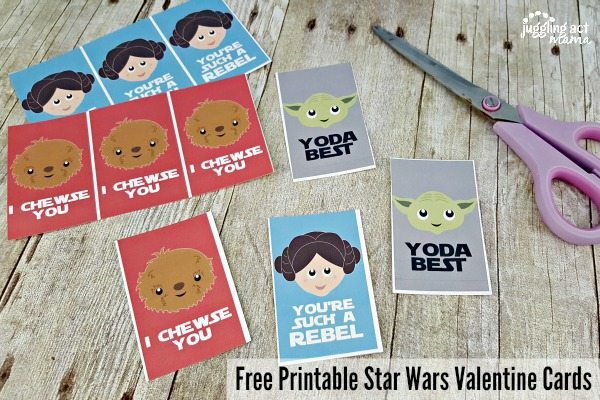 Download these cute Star Wars Valentine Party Printables, including Valentine Cards – all free! 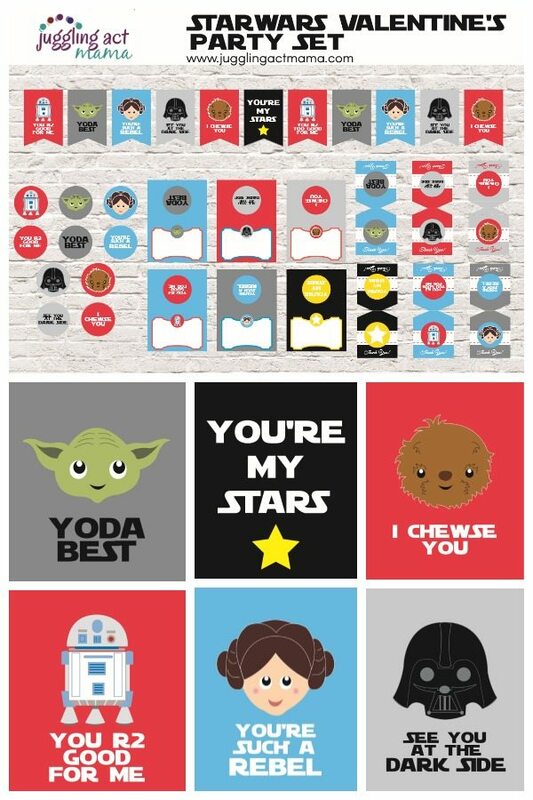 These printables are all inspired by the Star Wars movie franchise but are not authorized by Disney, Lucas Films or any other entity. My kids are crazy in love with all things Star Wars right now. I mean, they are obsessed. I mean, I like Star Wars well enough, but our house is non-stop Jedi battles and whatnot. The other day, my daughter Olivia, 4, wrapped a blanket around her head like a robe, brandished a stick of pepperoni and said “May the Force Be With You.” It was almost too much for this mama to handle. 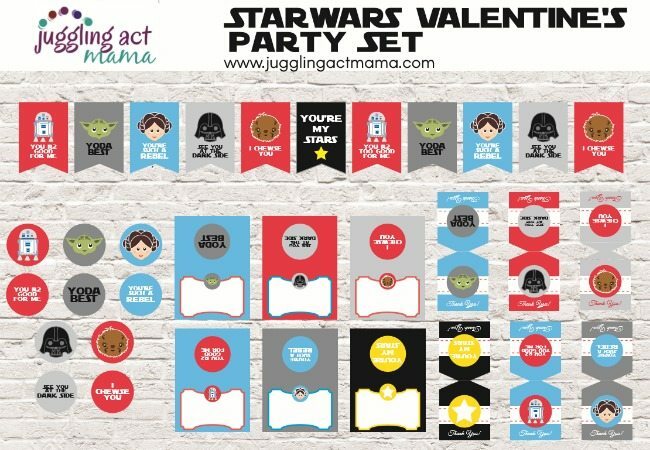 So I decided to create a set of fun Star Wars Valentine Party Printables including Valentine Cards for the kids. We’ve got everything you need to host a fun Jedi-worthy Star Wars party! This set includes food tents, cupcake toppers, treat bag toppers and bunting. I use my Medium Fiskars Round’n Round Squeeze Punch to cut out the cupcake toppers. Then I affix the circles to lollipop sticks using Star Wars Washi Tape. It’s so simple and the kids can easily help you put these together. Not only do we have your party decorations covered, we’ve even got cute Valentine Cards for you to download and print! 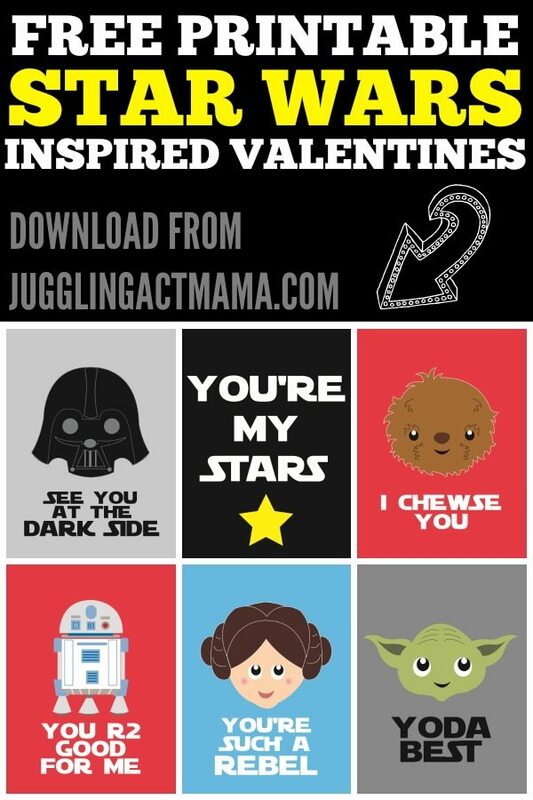 These cute Star Wars Valentine Cards couldn’t be more simple – just print, cut and write them out! They’re so fun! The Princess Leia one is my favorite, and the R2 D2 is a close second. I love reading your comments – leave me one below and tell me which is your favorite? Disclosure: This post contains Amazon Affiliate links. Any purchases through these links will earn Juggling Act Mama a small commission. This does not increase the cost to you, but does help support Juggling Act Mama. For more information, please see our Disclosure Policy. Hi Ang! 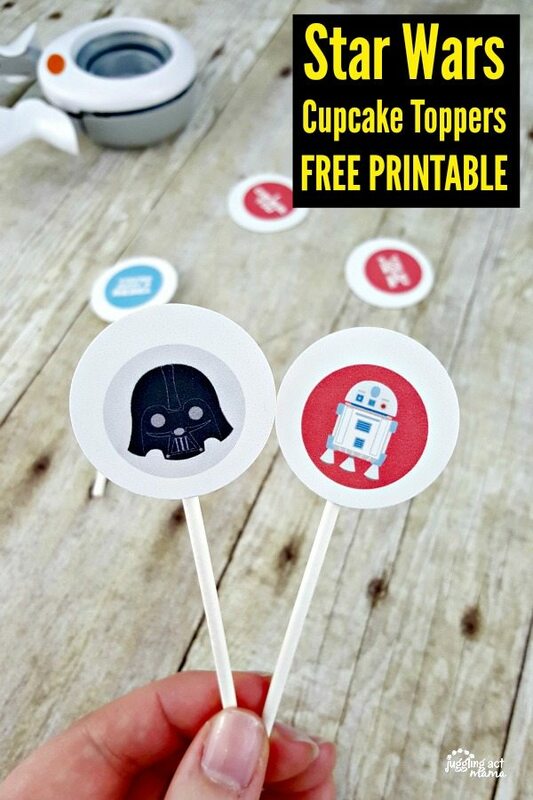 I mentioned your Star Wars free printables with permalink on my latest blog post. You are very creative. Thanks so much for including my link, and for taking the time to leave me a sweet note! Happy Monday! These are so cute. This post if Featured at the Merry Monday party this week. Pinned it. Thanks for sharing. So cute! Thanks so much for linking up with us at Funtastic Friday!